This summer the EATWISE interns partnered with the New York City Department of Health and Mental Hygiene to make over six bodegas and supermarkets in the East Tremont neighborhood in the South Bronx. The goal of this partnership, called “Shop Healthy Bronx,” was to make nutritious options more accessible where people shop. When we first entered a store, we used an evaluation assessment sheet to look for the important things we might have to change. Was the water at eye level? Did the deli offer a “combo” of healthy items for one price? Were nuts and dried fruits available? Did the ads on the walls promote unhealthy food? If something was missing we marked it down on our assessment sheet. Once we completed our evaluation we repositioned products and put up healthy marketing signs. Most of the bodega owners allowed us to move water to eye level and soda to the bottoms of shelves or fridges. This encourages shoppers to grab a bottle of water instead of a sugary drink, since people tend to take what is placed right in front of them. We also hung “shelf talkers” next to price tags. These signs promote healthier choices. For example, some say “Choose whole wheat pasta, oatmeal and brown rice,” “Look for canned products that are low in sodium,” and “Choose 1% or fat-free milk.” Sometimes customers don’t know that there are healthier options because they don’t look at the labels. Our shelf talkers help them easily find the better choices. The EATWISE teens also put up price tags with eye-catching words like fresh, ripe or juicy next to fresh produce to market whole foods. This encourages buyers to select fresh fruit instead of a bag of chips or candy. In addition, we often moved food stands holding nutritious items in front of those showcasing junk foods. The fresh produce was moved to the front of the store, as well as the nuts and dried fruit. This way, customers will see bananas, apples, peanuts, and raisins rather than cookies or soda when they first walk into the store. If there was a deli in the bodega or supermarket, we asked about putting up a deli combo poster. The combo usually consists of a sandwich on whole wheat bread, along with a piece of fruit and a bottle of water. Once we finished repositioning products and hanging shelf talkers, we met at the store’s front door and took down any unhealthy advertising, replacing them with our own “Shop Healthy Bronx” posters. This let’s incoming customers know that they will find healthy options inside the store. While our Shop Healthy makeovers weren’t extravagant, we were still able to get our message across: You CAN find healthy foods in most delis—and the EATWISE interns are making it easier. Annie is an Ambassador for EATWISE (Educated and Aware Teens Who Inspire Smart Eating), a Food Bank for New York City nutrition education program. Wash your hands! Use water and soap to wash for 20 seconds before handling food. Melt chocolate chips in the microwave gradually, stirring every 20 seconds. Break rice cakes into quarters. Spread each rice cake piece with a thin layer of peanut butter. Top with bananas, if desired. Drizzle chocolate on top of each rice cake piece and serve. Enjoy! Are you trying to #ChangeOneThing? Here at EATWISE we practice what we preach so we wanted to give you some quick and easy tips to make small changes in what you eat, which will lead to better health. Popcorn is a good example of changing an unhealthy snack into a healthy snack. A “regular size” movie theatre popcorn can have 1,200 calories and 60 grams of saturated fat! Try our microwave popcorn hack to healthy, whole grain popcorn quickly and easily. Just pour 2 tablespoons plain popcorn kernels into a paper lunch bag, fold over the top twice and microwave for about 2 minutes (or until popping slows to a few seconds between pops). This popcorn has only 30 calories per cup and is full of fiber! Invite your friends over for movie night and serve them your healthy, homemade popcorn. It will taste so good they won’t even know they are making a healthy change! Have a #ChangeOneThing tip for us? Tweet it and include #ChangeOneThing or #EATWISETEENS! makes me wanna say hurray! in our presentations everyday at school. No we don’t eat it. What would Valentine’s Day be without a sweet treat or two? This year, indulge guilt-free with a delicious—and nutritious—cookie recipe! Stir in oats and coconut, then fold in chocolate chips and walnuts (if using). Drop tablespoon-sized balls onto a baking sheet; bake for 10-15 minutes, or until lightly golden and crispy. EATWISE Summer interns display freshly organized produce baskets. This summer our EATWISE interns partnered with the DOH’s Shop Healthy initiative. They went to bodegas in the Hunts Point neighborhood in the Bronx and assisted in making small changes that would both encourage and make it easier for New Yorkers who shop at those stores to make healthy choices. These changes included placing fresh fruits and vegetables at the front of the store, removing ads for tobacco, alcohol and sugar sweetened beverages, moving water so it was eye-level in the drink coolers and advertising healthy lunch specials, which included a sandwich on whole-wheat bread, fruit and a bottle of water. This is what a couple of our interns had to say about the experience. This was our first summer working with Shop Healthy and it was an amazing experience! It felt as if we made a difference one step at a time. Even though not every change we made was big, they made a big difference to the community because we helped to make healthy produce more available. We went into Shop Healthy expecting that we would have a hard time working with the store owners, since we were just kids who wanted to make changes in their stores. We didn’t know what the outcome would be, but in end it was very successful and the store owners were very excited and also cooperative with us in helping to accomplish our mission of making it easier for their customers to make healthy shopping choices. We had tons of fun with our fellow interns moving the water up to eye level, putting up price tags for the produce, decorating and arranging the fruit to make the healthy options more eye catching. It wasn’t always easy to convince the store owner to move items, such as moving the water up so that is the first thing people see, but by working together we were able to come to an agreement. When we told the store owners that making these changes would help their community and increase their store profits they were eager to make the changes we suggested. Shop Healthy has been an outstanding experience and it felt as if we were giving back to the community. The changes we made in the bodegas brought us back to what we have learned in our EATWISE internship and through Change One Thing, eat more fruit and vegetables, choose whole grains over refined grains and drink water. Even though the changes were small, we made a major change for the community. Eating healthy? Not easy, but worth it. How often do you see celebrities promoting whole fruits and vegetables? There are lots of things that can impact the way you determine and view what you eat and your activities. Today the media is used to introduce us to the latest fad diets and weight loss pills. We are being influenced to consume cheap food with low nutrition content. This also includes the stereotypical personas shown to us on those ads or commercials. These portrayals only make us narrow our notions of what we can eat and do. But let’s go back one step, let’s talk about you and your goal of becoming more healthy and stronger. The easiest way to start is to eat more fresh fruits and vegetables, whole wheat, lean proteins, and reading the nutrition labels of the products you are going to consume! Obesity is increasing in America, this means that people are beginning to experience the side effects of an unbalanced diet. These include heart problems, cholesterol, and diabetes. Ask yourself, “Am I ready to give more effort and time to be more cautious for the sake of my health?”. You will often find yourself blocked by the lack of support, and the confusing nutrition labels, but you can do it if you want it. Make sure your circle of friends and family knows about your decision and if they value you they will give their support. “Am I ready to begin eating more fresh fruits and vegetables and reading nutrition labels carefully?” If your answer to both of these questions were yes, I congratulate you; you are taking a step that will take you far in life. Do you eat breakfast every day? A granola bar or an apple in the morning can make all the difference! Breakfast kick starts your metabolism for the day. Do you know what breakfast means? Breakfast literally means when you “break your fast” from the night before. Breakfast helps to increase concentration. Breakfast also increases your energy to seize the day. One drawback of skipping breakfast is eating too much later in the day. This leads to weight gain. Studies have shown kids who eat breakfast do better in school than kids who don’t. There are many examples of ideal breakfast foods. Some of these are (but aren’t limited to): milk, oatmeal, eggs and fruit. Basically breakfast should be high in carbs, rich in nutrients and low in fat. Although it may be tempting, don’t have an energy drink or double shot latte. The caffeine may give you energy but it doesn’t have the nutrients you need for a well rounded breakfast. Also, it probably has lots of added sugars, which you definitely don’t need. Having breakfast everyday isn’t hard, a little bit of time and effort beforehand can help you make the breakfast you need for the day. Don’t have enough time? The easiest thing to do is to buy a healthy breakfast, like an apple and yogurt. Your ticket for the: No, Seriously. 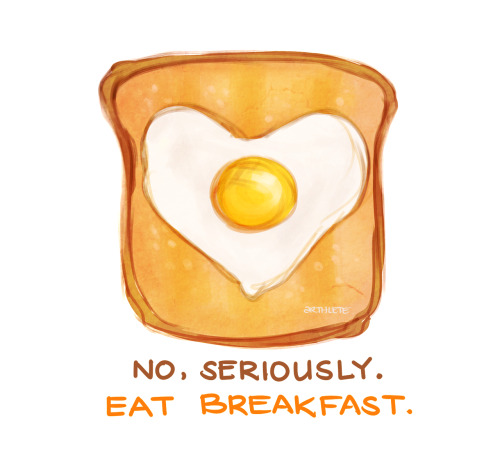 Eat Breakfast!